The genesis for this page was the mountain of scrap fabric that I always looked at and thought, “there has to be something I can do with that.” So I would stick it in little baggies and forget about it. But the pile grew and grew. This page collects all my project tutorials for things to do with remnant materials. This list will only continue to grow so make sure to check back in from time to time! In this first fabric flower example, I used some of the smallest of my scraps, those measuring about an inch, but at least three inches in length. I like to sew the flowers because glue is a messy and requires a lot of waiting. But, seriously, no actual sewing skills required! While you could just go round and round and sew your rows of strips to themselves, I like to use a sturdy fabric as a “base.” This is so I have more control of the “petals” and the shape. It also adds re-inforcement and makes applying the pins and clips easier. It doesn’t matter what this base fabric looks like, you shouldn’t be able to see it at the end with this style flower. 1) Gather your scraps! Any scrap at least one inch wide and three inches long. If you have wider strips, you can create fuller roses. 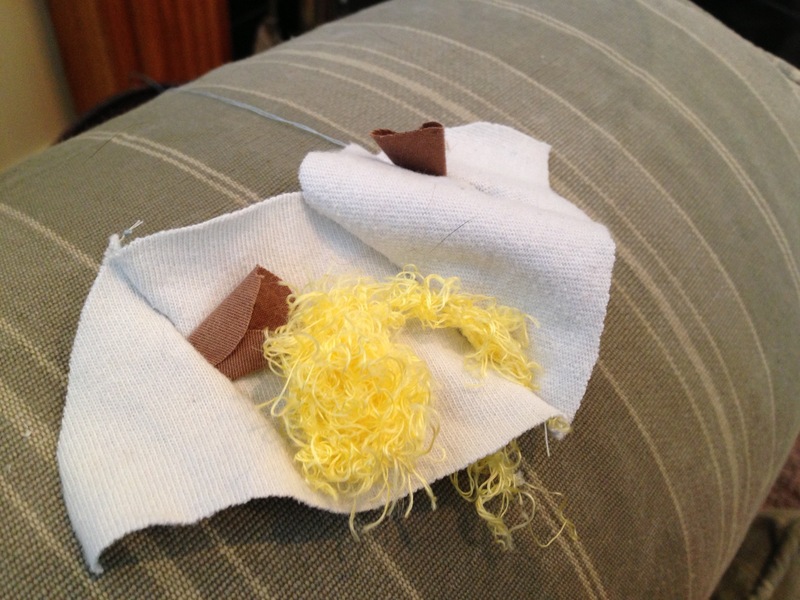 2) Begin sewing the ends together to form a strip. The longer the strip, the bigger the flower you will create. Also, if you feel your strip is wide enough, you can fold the strip in half and sew along the open bottom to create a long tube. 4) Begin by creating the center. As you make more and more of these…because I promise you will get addicted…you will develop your own style for the center. And don’t worry, if you create a gap you don’t love, you can always stick something sparkly in there to fill it in. I like to stick my fabric flat on the base, just south of the center and affix with a couple of stitches, then I fold the strip over and start the first petals over the fabric that has been stitched down so there is no gap. 5) Go round and round. Create “ruffles” by pleating. 6) When your flower has reached its desired size, stop winding and make sure everything is secure. Then cut out another circle of sturdy, coordinating fabric. This circle should be at least a quarter inch bigger than the base circle. I usually like to sew my pin and clip attachment separately to this circle before applying to the flower. I have seen many people simply glue these on. What ever works for you. Take your new circle and glue it on! I like to apply glue to the everything but the outer quarter inch of my finishing circle. That way I can stitch around the outside. I like to stitch the outside because many times the bottom isn’t completely flat, and stitching helps it hold together better. Plus sometimes you want to manipulate a petal here or there and stitching allows you to do that. These are fun and surprisingly sturdy. I made some for Christmas last year for each of my family and I am pretty sure they loved them. The trick to getting nice, thick coasters is using thick fabric, like upholstery fabric and a thick double-sided fusing like this awesome product, Bosal Craf-Tex. This particular product actually makes coaster sized, pre-cut, packages, but the store I was at only had the placemat packages, which actually turned out to be far more economical. This product is washable and very malleable. These are the materials I used, plus an iron, which I forgot to include and the sewing machine, which was in the other room. Also, I didn’t mention needle and thread ( or glue) to close your finish gap. 1) Decide how many coasters you want to make. Multiply this number by two and cut out that number of fabric squares. I have a square tool that I purchased a while ago that is 4 1/2″ (squared, obviously). This tool makes it easy to draw where I want to sew, leaving a 1/2″ seam. I happened to purchase this tool because it was one of my first forays into crafting and I was making a lot of them. However, no tool is necessary. You can just make two templates out of cardboard, one for the cloth and one for the fusible interfacing. So, if my cloth squares are 4 1/2″, and I am allowing for a 1/2 seam all around, my fusible interfacing will be 3 1/2 ” squared. You can adjust these sizes to your liking. Or maybe you have a tile you want to use as a template. Go with it. Your fusible interfacing should be the same size as your inner square. Cut out one square of fusible interfacing for each coaster. You can always trim your fusible interfacing squares later. 2) Coordinate your squares by choosing a front and back to each coaster and then flip each fabric so that the good sides are facing in towards each other and the bad sides are out. 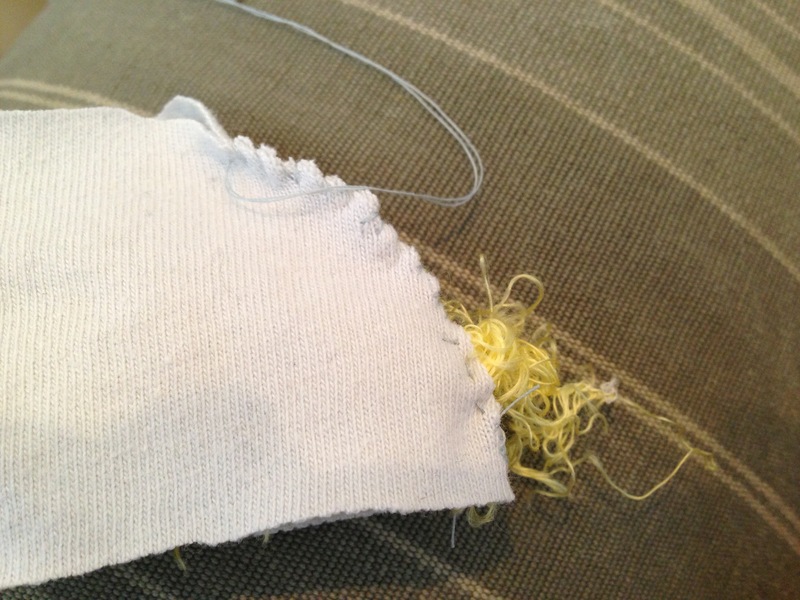 3) Sew around three edges completely. 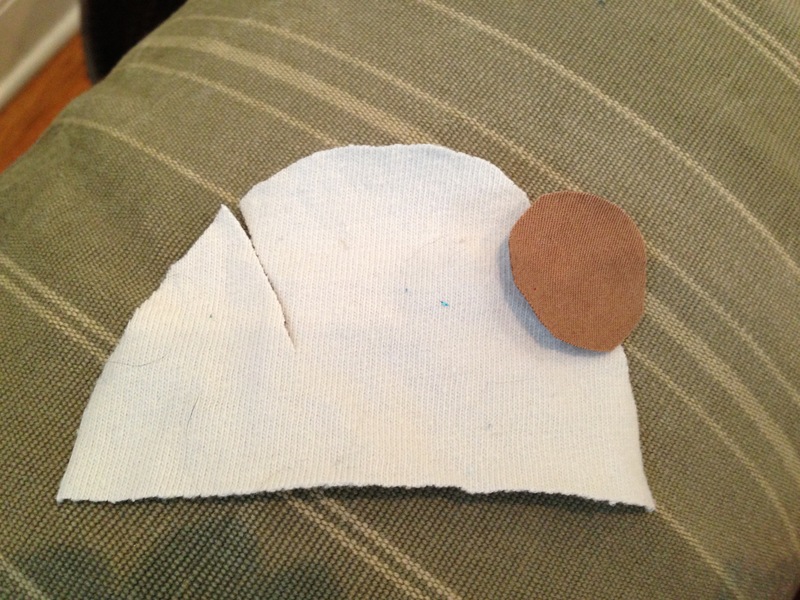 4) on the fourth edge, sew from the outer edge in on both sides leaving about a one inch gap. NOTE: Leaving only a one inch gap will make it challenging to get the thing flipped inside out, but… it makes sewing up the gap a little cleaner. Remember to double back on edges and on each side on the gap so that the fabric doesn’t come apart as you turn over or stuff with your fusible interface. 5) Trim edges, EXCEPT the edge with the gap. Leave that untrimmed to make stitching it up a little easier. 6) Turn coaster pretty side out and use some thing fine-tipped (but not too sharp) to poke out nice crisp corners. 7) Now you are probably wondering how to get your three inch+ square into a one inch gap. Just roll up the fusible interfacing and stick it in. Manipulate it to lay flat inside. 8) Once in position, with everything tucked inside, get your iron out and set to medium. Fold in the edges in the gap so that they sandwich the fusible interfacing, that way you get a crisp edge. I ironed directly on the outer fabric for several seconds on each side. 9) Almost done! Stitch up the gap. Use your favorite stitch, or even glue and clamp together. 10) Then, put to use right away or find a ribbon to tie up your fun little stack of coasters to give as a gift. 1) Cut a long strip about 1 1/2 ” thick. Make sure to use the seam here as a natural end for the headband. 2) Measure the strip so that it will go around your head, but so the ends just meet. The jersey material is stretchy so don’t worry you’ll go too small. Cut the strip into three strips only up to seam. Do not cut through stitching of seam. 3) braid length of strip making sure it doesn’t get all twisty. Secure end with something if you are not going to sew right away. 4) place ends together and fold the braided end into the seam so there is a nice, smooth finish. 1) Cut a thin strip long enough to go around your head about 1/4 inch thick. 2) Cut that into three really thin strips (like, thin enough to thread beads). Cutting the ends at an angle helps to thread the beads. 3) Thread several beads per strand and then randomly space them out on each strand. Save those seams! They can be easily made into great crafts. No scrap is too small. Granted, this flower is easier if you have one continuous piece, but even if you have short scraps that are slightly different widths, you can string them together to make this cute, sassy flower. 1) take a strip, it can be any length and width, as long as all strips are roughly the same width, and start a running stitch. 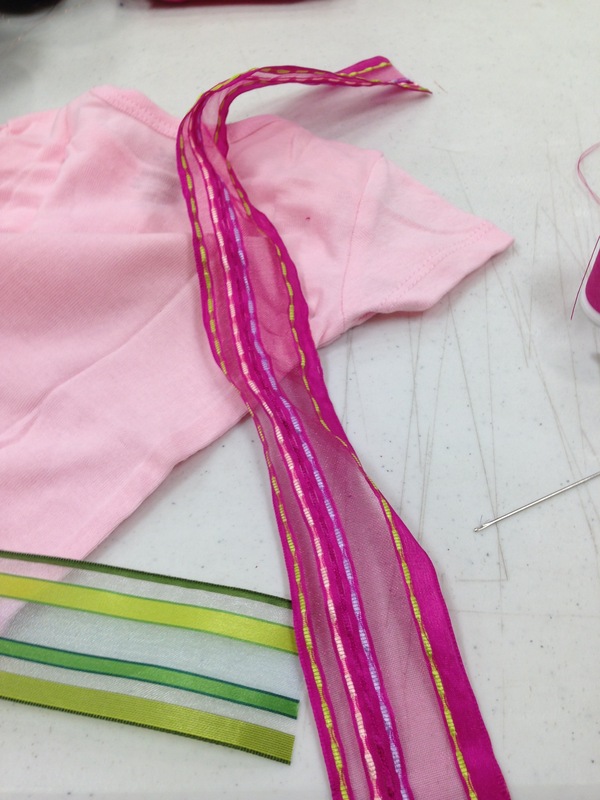 Once you have about twelve inches of strip with a running stitch, pull down and ruffle the entire length. 2) Once you have achieved desired ruffleiness, secure the strand with a knot so it stays pit. Then sew the ruffle around starting from the middle and working it around and around. Make ad full as you would like. Stop building flower when you have the desired effect. 1) make five circles of the same size. 2) fold your circles in half and connect with a running stitch. 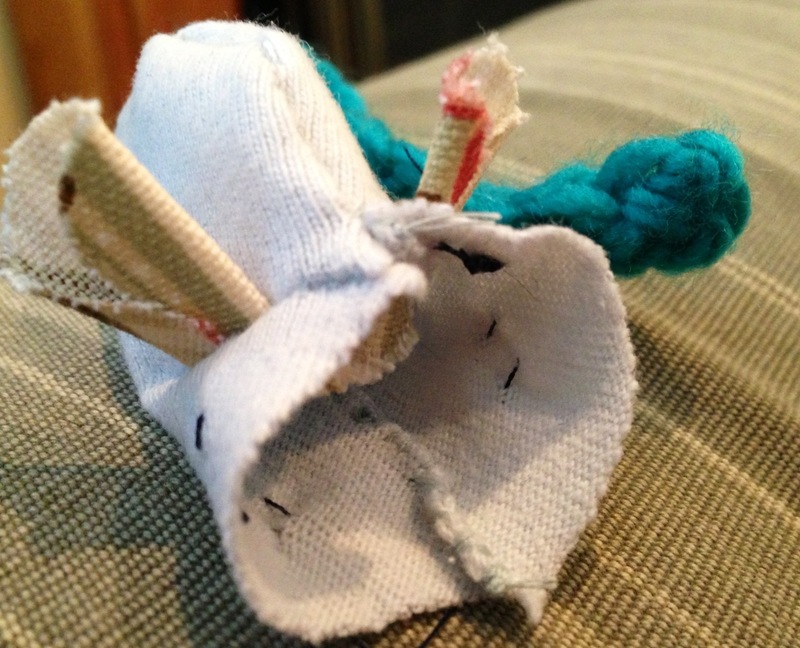 3) pull fabric along thread until it forms a cute little flower. Sew closed. Here is a fun flower tutorial. In this style you cut out individual petals. The trick, though, is to use a lighter or flame to curl the petals. So you need to find a fabric that will basically melt instead of burn. I have found that many shiny ribbons will work very well. A ribbon, a flame, scissors. You can use a candle like in the photo, but I honestly found more control with a lighter. The downside is that the sucker gets hot! 1) Cut your ribbon into pieces that you can then shape into rough petals. You can vary the size of your petals or leave them all the same…it’s really up to your own design aesthetic. 2) Once you have all your petals roughly cut, hold them over the flame to melt the edges and get them to curl slightly. You will get a sense of how the fabric behaves after just a few petals. 3) Once you have amassed your petals, start constructing your flower. Again, I like to use a base of sturdy fabric to sew the flower onto so that I have control of its shape. I prefer to sew, but there is no reason you couldn’t glue the thing if that is your preference–except that it’s messy and not as sturdy. 4) Keep going until you are satisfied with the size and fullness of your flower. You can always go back and fill in spots and manipulate the petals by holding a flame to them. The ribbon melts and can then be molded into shape as it closed. Here’s another flower done in pink and organza ribbon. I attached a pin and clip to the back to make it wearable. For many years, my go-to baby gift was a set of totally over-priced (but thoroughly adorable) baby socks and a crinkly, rattle-type things. Recently, though, I wanted to make more personal gifts. And I was on this scrap fabric kick so I wanted a project that I could make with scraps. The first project I made was using scraps on plain baby onesies double-sided fusing to make cute designs. This was super easy. The hardest part was coordinating fabrics and cute designs. It helps to draw out a simple sketch so that you can visualize the image. Then you just follow the instruction on the fusible webbing. 1) Take one annoying wire hangar (like the ones from Dry Cleaner). With tin snips, cut off both sides just where the hanger starts to swoop up. Entwine the two ends together and once the connection is secure, push and pull the hanger into a circle. Granted, it many not be a pretty circle but that is okay because you will be covering the hanger. 2) Cut many, many strips of really any lightweight fabric and wind around the circle until you can no longer feel the pointy tips I recommend around three layers. I distressed the edges for that shabby baby effect and used glue to make the fabric stick. 3) At this point, it is time to make the hanging implement. I used tulle because I had a lot of it. I took four long pieces of tulle and wound and knotted them at four opposite points on the circle, but really, any ribbon, or even long fabric pieces would work. NOTE: I later decided to hang a little owl from the center…and had to go back and fix things. So, if you want to hang a critter from the middle, it would be easier if you hung an extra length of tulle or your ribbon of choice from the center now. 4) Take all the lengths and gather them about one foot above the circle. I tied a knot. Don’t bother trying to tie a bow because it will be impossible to get all the lengths to be the same. Since I was using tulle, I knew I could get a big poofy puff at the end. To do that, I folded back all the ends and tied them with a piece of twine. I then cut off the ends that were beneath the twine and covered the twine with a thick piece of tulle, which was glued down. 5) Now that the structure is in shape, it is time for the fun (and time consuming) part of making whatever it is to hang from the mobile, I made little owls. Clearly, any little bug or animal design would work. I wanted to make them two sided and poofy, with feet and ears sandwiched in the middle. This was just the way my little owls developed, which created a little extra work but was worth it, I think. Above are pictures of the materials for constructing my owls. The fronts were made up of a big circle for the body, a smaller oval for the belly, two pointy ovals for wings, and a triangle piece for a nose. (See the photos below). The back had a big circle for the body, and a tail. In addition to these pieces, I used a polyester batting for stuffing, double-sides fusible webbing, tulle for hanging the owls and the mobile, and fabric paint for the eyes. You can use regular glue, too, but the fusible stuff dries a lot more quickly. I fashioned some ears and feet. My owls were constructed by taking one of the circles and sticking on the pieces on the front and then taking the other circle and sticking the little tail on the back. At this point, the front and back are not attached. If you have ears and feet, you can now attach them to one of the sides, on the inside. Since I wanted to make these owls poofy, at some point I needed to stuff these little guys. At first I tried to stuff them like little dumplings, i.e. stick a clump of stuffing in the center of my owl and sandwich it in, but that made it tricky to add enough stuffing. After a different methods, I found that what worked best was to fuse the edges a portion at a time, until I had a gap (usually between the ears) to shove stuffing into. This made for lil’ fat owls. I could then finish with my tulle ribbon between the ears. I stuffed the ends of the tulle into the gap between the ears and fused them to seal the tulle inside. By leaving this step for last, I could wrap the ribbon around the circle hanger and not have to worry about tying it on. Then repeat several more times until you have enough little fellows to be happy with your mobile. I did nine owls of varying sizes, fabric combos and styles. The final touch was to add eyes. I decided to use fabric paint for the eyes mostly because the idea of cutting out all those little circles made my head spin. The fabric paint was a lot easier. And now it’s ready to lull a baby to sleep. So what else do you need for this super easy project? 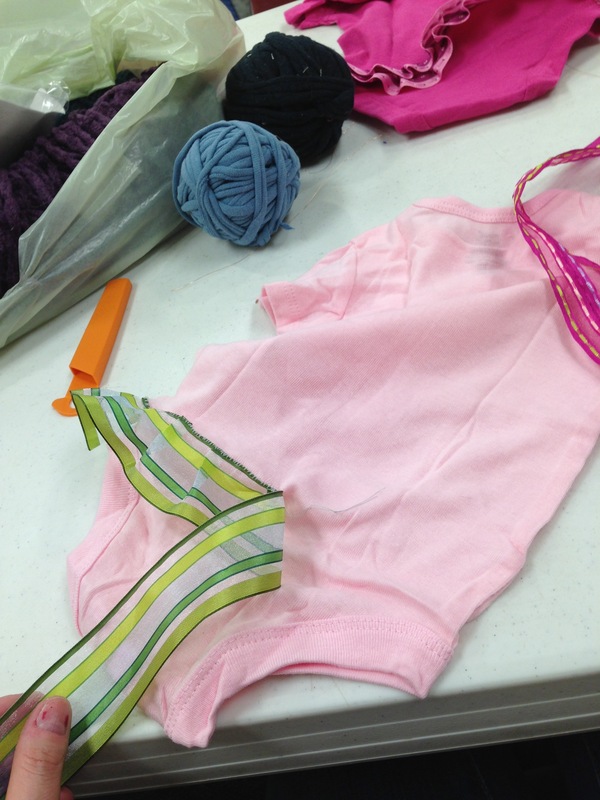 Just a plain onesie and some thread–and any scrap fabric or ribbon. 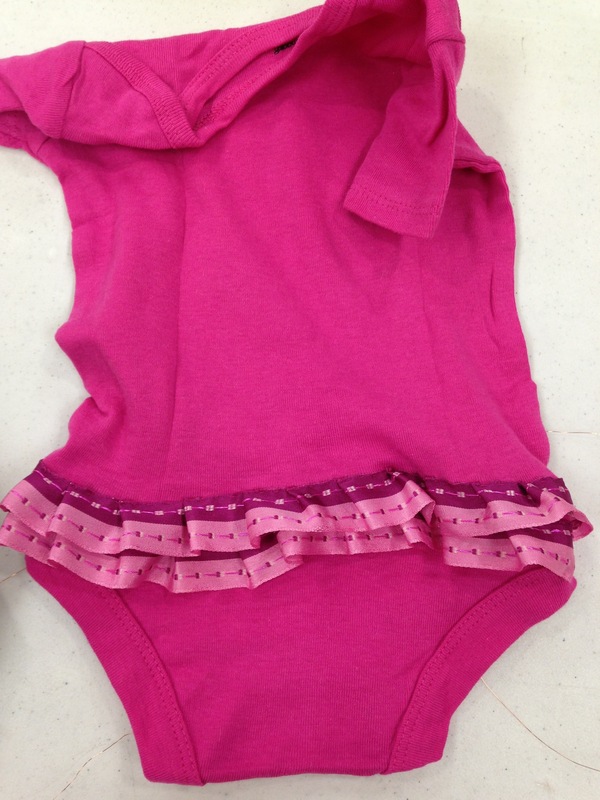 Everything is cuter with ruffles, but there is something about a ruffly baby bottom that is beyond cute! It’s pretty self explanatory. You start sewing at one end and then every so often at random intervals, you do a little pleat to create a ruffled effect. I started doing a running stitch and then switched to hemming stitch. I think. Like I have mentioned before, I am not much of a sewer. I am a doer. My goal was to attach those ribbons to that cloth and that is what I did. I’d like to flatter myself that I invented a new stitch, but I didn’t. I just don’t know what it’s called. You can also do a ruffle on a sewing machine first and then attach to your onesie, which would leave a much neater stitch on the inside. But I was at a thing that did not allow for machines, so I hand-stitched. Here is another one I did that same night. I hand-stitched these. I made both of them in about three hours, and about an hour of that was just figuring things out. I made the second one in half the time of the first. You can probably knock these out in mere minutes on the sewing machine. But, I made mine during an “open craft” night and didn’t think I should bring my sewing machine. The only tricky thing about these are the edges. Ribbons fray pretty easily. I have two suggestions: First, simply fold over the ribbon before you attach it and sew seam. Or, second, take a lighter to the edge of the ribbon and, very carefully, let the edges just barely melt. Also, if the ribbon has wire, remove it! This is really easy. Just poke it out of one end and pull it through. 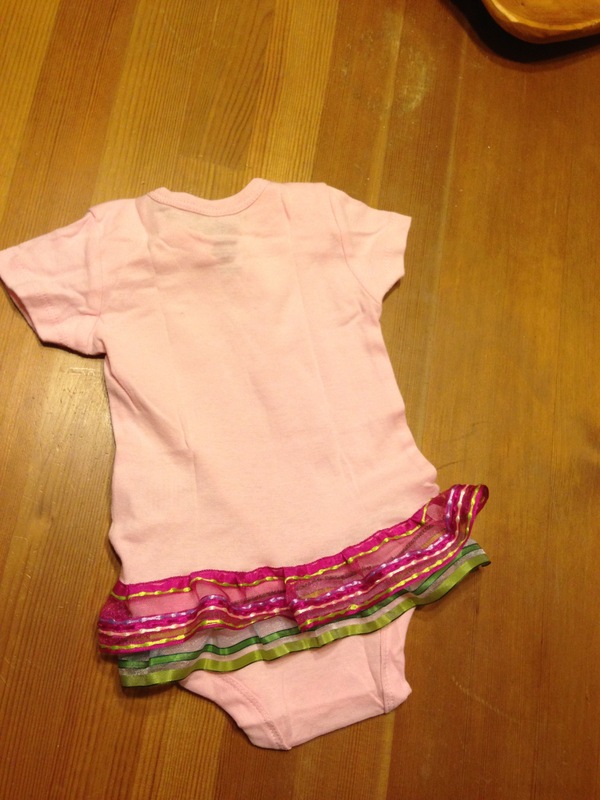 There is very little you can make for a baby girl that is not huber adorable, but these are cute– and sew simple! Sorry, couldn’t resist. Do you have go-to hand made baby gift items? I would love to hear your ideas! And if you try this please send pics. Like always, feel free to share his post. 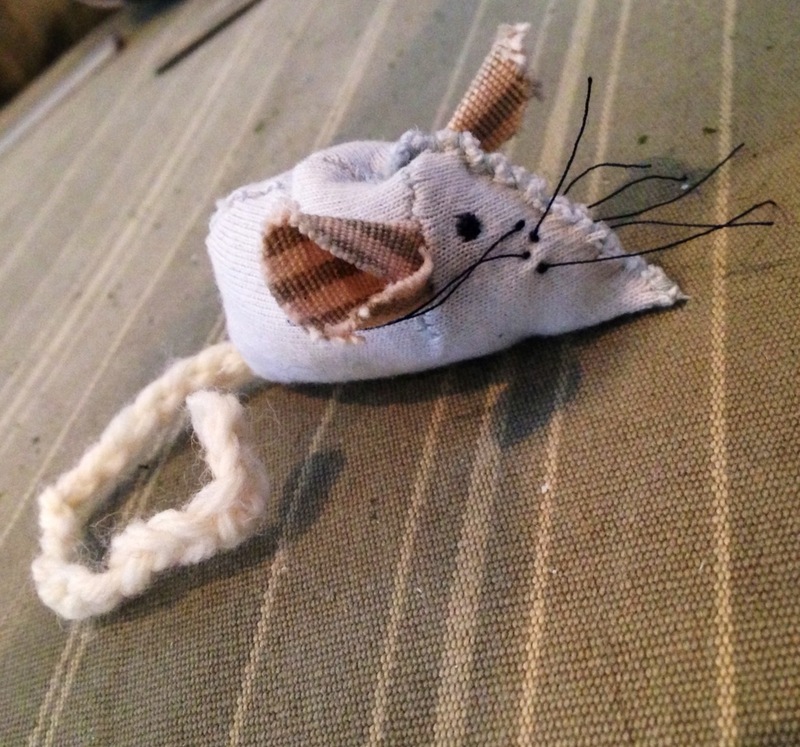 Above is the beady little face only a cat can love–especially when stuffed with catnip! These little guys are a bit labor intensive for the small package, but just wait until your cat goes bonkers over them. You’ll be so proud of yourself. 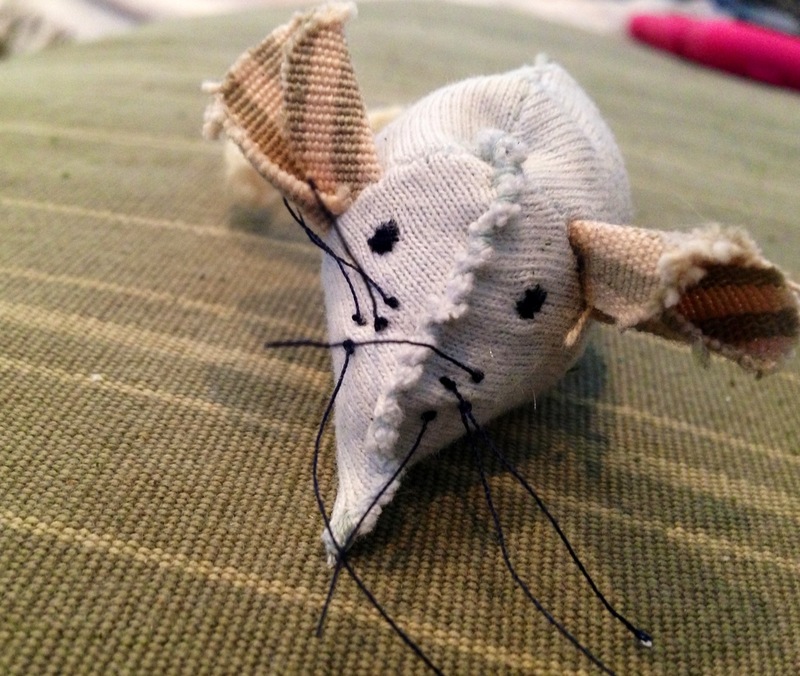 What you’ll need: fabric, twine or yarn for the tail, stuffing, and catnip. I hand stitched these but there is no reason you can’t use the machine for the first few steps, especially if you plan on making many of them. This project is perfect for an old t-shirt. 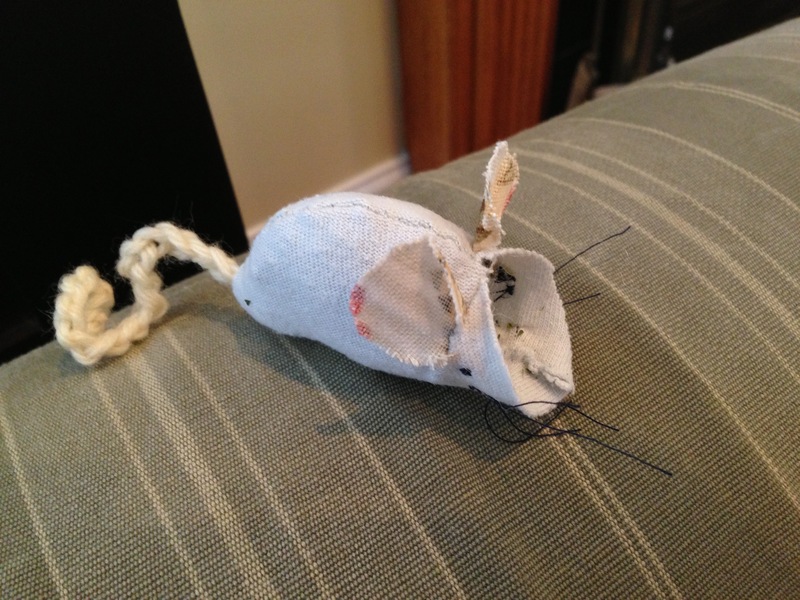 If you’ve been into making t-shirt yarn lately and have a bunch of sleeves and chests left over without any idea of what to do with them, here is a great use because these mice use up small snippets of fabric. And the t-shirt is nice because it is stretchy and you can make fat little mice. Start off by cutting two half circles for the body and two small circles for the ears. Place the two pieces together. If your fabric has a good side and a bad side, put both bad sides together. Decide which end will be the “head” and cut a slit until about half way down. I only showed one side in the photo above, but you really should cut them together so they are even. I’m sorry, I skipped like three steps in the next photo. It’s just that you get really involved in the “production” of them and forget to take pictures. 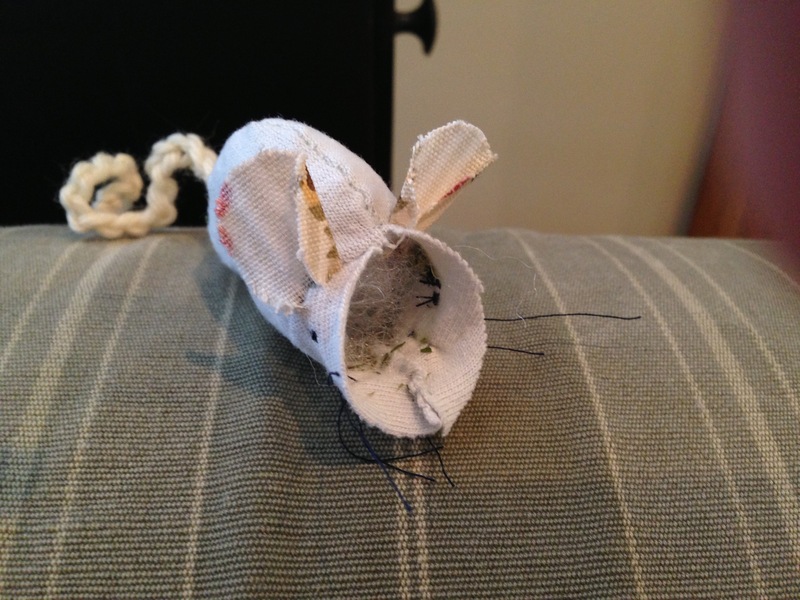 But the next photo reflects what the mouse looks like after attaching the ears and sewing on the tail. I will try and explain as well as possible, though. 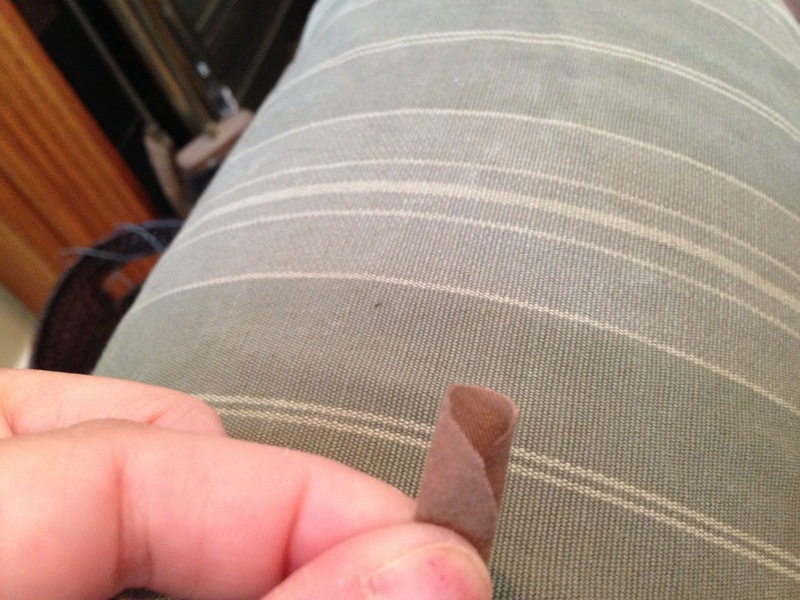 Take one of your little ears (circle) and roll it like a waffle cone so it’s a little wider on top. Take the rolled ear and stick the end through the slit and fold back the half circle so that you are holding the ear inside the fabric. At this point you should see only a small end of your rolled eat and have a seam to sew up along that slit you previously cut into the half circle. Now you have to do the same thing on the other side so that they mirror each other. When you are done with both ears, you will have two semi-circles again, but this time with ears in the middle-ish. Stick them together so the ears are inside. Next we attach the tail by having one end of the tail stick out the back end. If there is a good end and a bad end to your tail, have the bad end stick out the back. It will be inside when you flip the mouse inside out. It may help to roll up the tail so you can keep it all inside if you have a particularly long tail. Starting with your tail end, start stitching along the outer half circle to close up the two sides. Stop at ears. Then sew along the straight bottom edge to close up the seam. You are now ready to flip it inside out and should have all of your seams closed up except for “face” area. 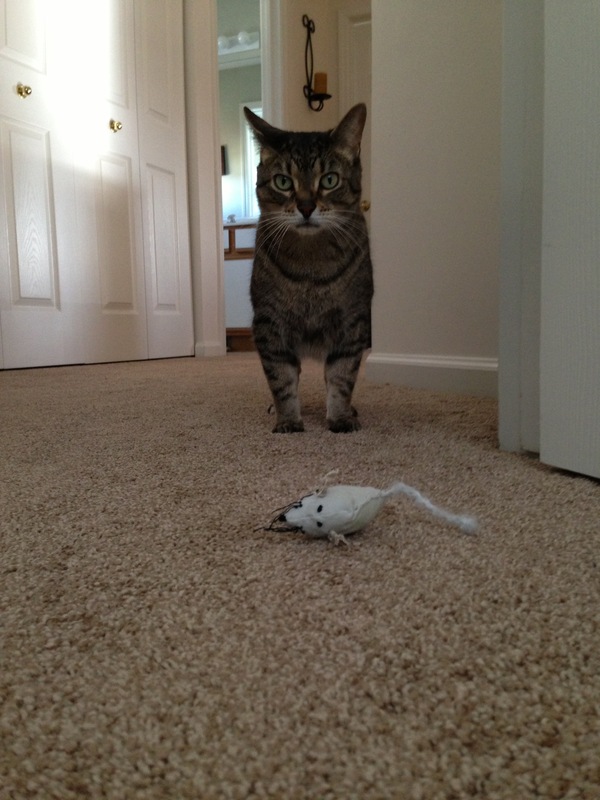 At this point, you have to decide whether you want to put whiskers and eyes on the little mouse. Trust me, the cat will play with it regardless, so you really can skip it… But they are so much cuter with the little details. Now is the time to add eyes and whiskers if you want them. I used regular thread, but if you have something a little thicker, sewing some eyes on the thing will be sooo much easier. The eyes are self-explanatory. Stitch a circle with the thread. The whiskers, those required more creativity… And explanation. We are essentially going to make one stitch– on the inside. Thread your string but don’t tie it off. 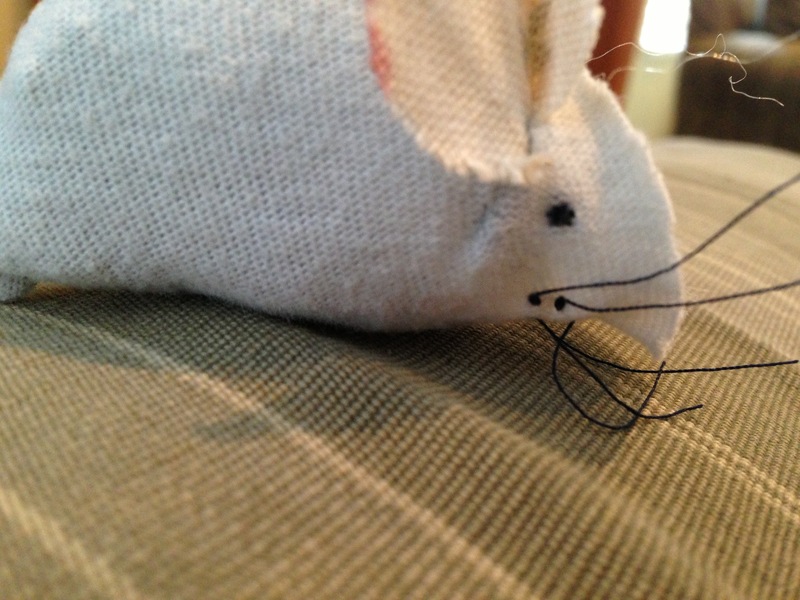 Starting on outside of mouse, you want to pull thread through create a small stitch inside and pull back out. Leave the thread long for the moment. About one half inch from one end, tie a knot (enough to not pull through). Now pull through from other end until the knot stops the thread (yay, one whisker has emerged!). As for the other whisker, you now need to tie a knot on the other side of the stitch to keep whisker from pulling through. See the second photo below to understand how the stitch is on the inside and the first photo to see how the knot on the outside keeps it from pulling through. Now all of our hard work is done and we can stuff the little rodents. I used poly-fiber stuffing as well as catnip to make them nice and fat. Just shove it in there. When the mouse is as full as you want it, stitch up the face. Just pay attention to where the eyes and whiskers are so they line up. Final step: find a cat.